In recent weeks, I have distributed articles describing plans by Democratic presidential hopefuls Elizabeth Warren, Kamala Harris and Bernie Sanders to increase income taxes to 70% or even 90% on the rich, impose “wealth taxes” on their net worth and impose estate taxes that are equally onerous when they die. The result would be that working people would pay state and local income tax on their wages, super-high income taxes on interest and dividends and annual wealth taxes and whatever was left over would be confiscated when they die. In case you think these proposals are too extreme to become law, you might want to check out the polls. 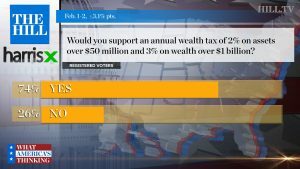 This article says that recent polls show 74% of registered voters support a 2% annual wealth tax on those with $50 million of assets and 3% on those with $1 billion of assets.